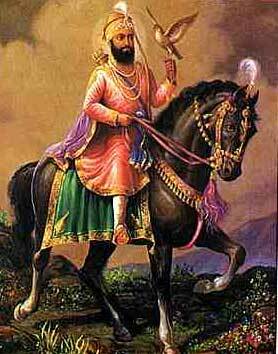 Guru Gobind Singh JI was born in the year 1666 as Gobind Rai, to the ninth Guru of Sikhism, Guru Teg Bahadur Sahib ji , and Mata Gujri, at Patna Sahib.He ascended to become the Tenth Sikh Guru at the young age of nine, following the martyrdom of his father and Ninth Guru, Guru Tegh Bahadur Sahib ji , who been approached by Hindu Brahmins from Kashmir to seek his intercession against the religious fanaticism of the Mughal empire’s General Iftikar Khan. At the innocent behest of the nine year old Gobind Rai (who had remarked that “None could be worthier than you, father, to make a supreme sacrifice”), Guru Tegh Bahadur Sahib Ji had courted death and was publicly executed at the imperial capital Delhi in the year 1675. As the tenth Sikh Guru, Guru Gobind Singh carried forward the sanctity and divinity of Guru Nanak Dev Ji and the succession of the Sikh Gurus, and came to be renowned as a spiritual master, warrior, poet and philosopher. His spiritual revelations, constantly emphasizing the worship of the One Supreme Being and deprecating idolatry and superstitious beliefs and observances, are recorded in his various literary compositions, such as the Jaap Sahib and the Akal Ustat . The day of Baisakhi in 1699 marks one of the most hallowed days of the Sikh religion. On this day, after having received edicts from Guru Gobind Singh, a large congregation of Sikhs had gathered at Sri Anandpur Sahib (the city of bliss, located in the lower spurs of the Himalayas). With a century of religious persecutions and martyrdoms (including those of Guru Arjan Dev JI and Guru Teg Bahadur JI) serving as the background, Guru Gobind Singh addressed the congregation in a stirring oration of his divine mission, and then unsheathed his sword and called upon those congregants who were willing to give their heads to the Guru. Those who answered the call were initiated by Guru Gobind Singh into the Khalsa, an order of Saint-Soldiers, who were to forever have faith in one universal timeless creator God, who would consider all human beings equal, irrespective of their caste and creed, and who would have the mission of upholding right in every place.The Khalsa represents the epitome of the Sikh way of life, with Guru Gobind Singh having himself professed “Khalsa mero roop hai khas, Khalse main haun karoun nivas (The Khalsa is my own special form. Within the Khalsa, I abide)”. An estimated 80,000 Sikhs were initiated into the Khalsa in the days following the Baisakhi of 1699. Standing up as members of the Khalsa, Guru Gobind Singh’s four young sons (Sahibzada Ajit Singh,Sahibzada Jujhar Singh, Sahibzada Zorawar Singh, Sahibzada Fateh Singh) also subsequently attained martyrdom. On learning of their sacrifices, the Guru had famously remarked : “Chaar muye to kya hua jeevat kai hazar (So what if I have lost four of my sons, many thousands live“ (referring to the Sikh Khalsa family). Citing his “unparalleled efforts and sacrifices in fighting injustice and tyranny”, Guru Gobind Singh has been referred to as Sarbans Dani (the merciful donor, who sacrificed everything) and Mard Agamra (a man non-pareil).